In the lead-up to Christmas, the busiest time of year on the bookselling calendar, Books+Publishing is asking booksellers across the country to predict their biggest sellers and ‘surprise sellers’. In the this week’s instalment of the series for the 2018 Christmas period, Katy Downey from the Leaf Bookshop in the Melbourne suburb of Ashburton shares her predictions for what will sell this Christmas season. Marcus Zusak’s Bridge of Clay (Picador), Jane Harper’s The Lost Man and Liane Moriarty’s Nine Perfect Strangers (both Macmillan) are all strong sellers, as is Lee Child’s Past Tense (Bantam), and these should continue to do well. I expect we will be selling Trent Dalton’s Boy Swallows Universe (Fourth Estate) right through Christmas and beyond. 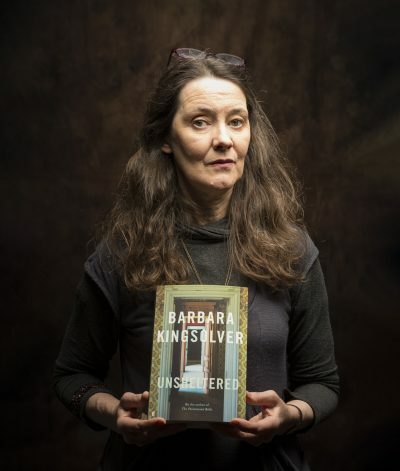 Barbara Kingsolver’s latest novel Unsheltered (Faber) may be her best yet. We also love Sally Rooney’s Normal People (Faber) and Donal Ryan’s From a Low and Quiet Sea (Doubleday). The Land Before Avocado by Richard Glover (ABC Books) and Peter FitzSimons’ new book Mutiny on the Bounty (Hachette) are guaranteed good reads. Leigh Sales’ Any Ordinary Day (Hamish Hamilton) is a must read. Sally Field’s autobiography In Pieces (S&S) is divinely well written. Gillian Triggs’ Speaking Up (MUP) is, like Michelle Obama’s Becoming (Viking), a recommended read. The James Packer story The Price of Fortune (Damon Kitney, HarperCollins) has found a lot of readers. A title we have been doing really well with since release is Michael Veitch’s Hell Ship (A&U). Ottolenghi Simple (Ebury)—in fact any Yotam Ottolenghi title does well for us. The new Donna Hay, Christmas Feasts and Treats (Fourth Estate), is already in high demand. We get a lot of requests for vegan and vegetarian cookbooks, and the paperback version of Anna Jones’ A Modern Way to Cook (Fourth Estate) ticks that box, as does the ’15-Minute Vegan’ series by Katy Beskow (Quadrille). The Art of Pasta by Lucio Galletto & David Dale (Lantern) is popular, and the new Hetty McKinnon, Family (Plum), is a safe bet too. Dorling Kindersley’s Art: The Definitive Visual Guide (Andrew Graham-Dixon) is glorious. Around the World in 80 Trees by Jonathan Drori has breathtakingly beautiful illustrations by Lucille Clerc (Laurence King). Resident Dog: Incredible Homes and the Dogs That Live There by Nicole England (Thames & Hudson) and Garden Love by Simon Griffiths (Thames & Hudson) have beautiful photos of beautiful gardens, beautiful houses and beautiful dogs. David Coles’ Chromatopia: An Illustrated History of Colour (Thames & Hudson) is a visual treat. Some of the best children’s books are sequels: Wundersmith by Jessica Townsend (Lothian), Jaclyn Moriarty’s The Slightly Alarming Tale of the Whispering Wars (A&U) and Katrina Nannestad’s The Girl, the Dog, and the Writer in Provence (ABC Books) are all winners. The new David Walliams, The Ice Monster (HarperCollins), is hard to keep on the shelf, and middle fiction Bob by Wendy Mass and Rebecca Stead (illus by Nicholas Gannon, Text) is a delight. For younger readers, The First Adventures of Princess Peony by Nette Hilton (illus by Lucinda Gifford, Walker Books) and Mr Penguin and The Lost Treasure by Alex T Smith (Hodder Children’s) are great fun. Peppa Loves Australia (Ladybird), Pig the Grub (Aaron Blabey, Scholastic) and Dragon Post by Emma Yarlett (Walker Books) are top picture books. We do really well with kids’ nonfiction, and Lonely Planet Kids’ Build Your Own Dinosaur Museum and Adam Spencer’s The Number Detective (Brio) are looking good. The Short & Curly Guide to Life by Matt Beard and Kyla Slaven (illus by Simon Greiner, Puffin) is racing out the door. Steam Australia: Locomotives that Galvanised the Nation by Tim Fischer (NLA Publishing) is a fact- and photo-filled hefty history book generating lots of interest. Short stories are difficult, but we are starting to hand-sell Friday Black by Nana Kwame Adjei-Brenyah (riverrun)—a fantastic collection.